New Weekend Buff: Spooky Happenings! Tags: crusaders, buff, weekend, fun, spooky happenings. There's something odd in the air tonight. Is it another tier 3 event? Yes, that must be it. Hopefully these buffs will help. The following Crusaders will get a buff this weekend starting from today until noon PT on Monday, October 30th. Check out these limited-time Spooky Chests that contain equipment for just the five Crusaders above! Tags: bw2, explorer, league, part3. Are you one of the intrepid Bush Whackers who has collected all 20 Lockbox Keys and have completed up to The Torrid Top? Then Josephine, the leader of the Explorer's League, would like to talk to you again. Talk to the Town Crier in the Commons, then seek her out on the fourth story of the Skyscraper to get started. This new series of quests will challenge skills you learned long ago, and take you all over the lands of Bushwhackia in the process. A new quest will unlock daily, if you've completed the previous one the day before. Good luck! Tags: bw2, update notes, oct2017. - Added Part 3 of the Explorer’s League Epic Quest Line, which includes 20 new challenging daily quests. You must have completed Part 2 at least a day prior to starting, and have completed The Torrid Top area. - Swapped some reveals for the 2nd field in The Verdant Undergrowth so the friend blocker can be accessed earlier. Huge thanks to our fans for playing Idle Champions of the Forgotten Realms in Early Access! In order to celebrate, we'll be giving away our brand-new Starter Pack DLC for free for the next week, and an additional three lucky players will win Idle Champions T-Shirts through our Livestream T-Shirt Giveaway! 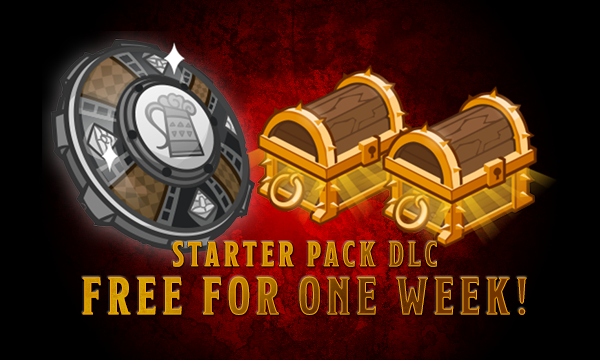 Starter Pack Now FREE Until November 2nd! In order to celebrate our fans and this journey we are taking together, we are making our next DLC free for the next week! Head on over to our Steam page and receive your Starter Pack, which includes two Gold Chests and a shiny shield for Bruenor. This offer expires on November 2nd, so don't delay! 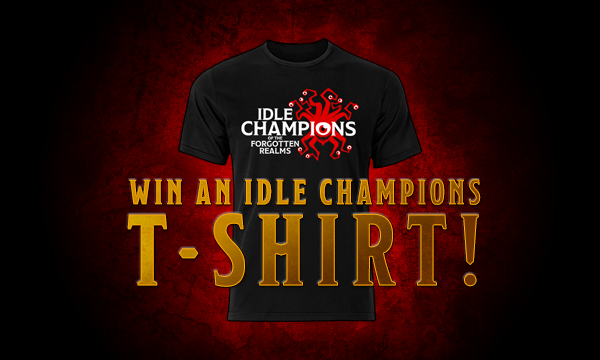 Win An Idle Champions T-Shirt! We also have a t-shirt giveaway over the next week! In order to sign up for the giveaway, head over to http://bit.ly/IdleChampionsShirt (case sensitive) and enter to win. Three winners will be drawn at random to collect the prize during our next livestream on Thursday, November 2nd, starting at 1:00pm Pacific on the Official Dungeons & Dragons Twitch Channel. NOTE: You will need a Twitter account in order to participate. Tags: october, 2017, release notes, bw2. - Added a new haunted house critter, replacing the Sparkly Vampire, which can still be bought for BB. - If you didn’t get all your Dawn of the Dead rewards, you can collect them from George in the Commons until Monday October 23rd at noon. Sorry! New Weekend Buff & Tier 2 11th Objectives! Tags: crusaders, buff, weekend, fun, idol acceleration. It's time to really pump up that idol gain (again) with another set of tier 2 11th objectives! Good luck, Crusaders! By completing the new additional Tier 2 11th Objectives in each campaign you can unlock more power for the Bonus Boss Idols feature: Bosses above area 100 may randomly drop additional idols when killed for the first time. This update includes the last four campaigns' 11th Objectives! Enjoy! Mischief at Mugwarts - Accio Difficulty: Areas gets more difficult much more quickly. Ready Player Two - Cheaters: Cheaters randomly spawn. Each cheater has a different special ability, such as instantly killing a random Crusader, or moving really quickly, or disabling a Crusader's DPS and Formation Abilities, etc. Idols Through Time - History Lesson: Various historic figures from history spawn and must be defeated. They each have an annoying ability. Amusement Park of Doom - Too Much Candy: Candy monsters spawn. Each time one is killed, it reduces the DPS of your formation by 50%, stacking multiplicatively. The following Crusaders will get a buff this weekend starting from today until noon PDT on Monday, October 23rd. Check out these limited-time Accelerating Chests that contain equipment for just the five Crusaders above! Introducing the Tomb of Annihilation! Today Champions can take their first steps towards the Tomb of Annihilation, an all-new permanent campaign! Our first Tomb of Annihilation update includes two new adventures, Ring of Regeneration and Seeking Allies, with one variant each, as well as a new Divine Favor currency: Kelemvor's Favor. Champions who have completed at least four other Sword Coast adventures can embark on the first Tomb of Annihilation adventures from the town of Daggerford! Ring of Regeneration and Seeking Allies can both be found in the town of Daggerford, along with one new variant for each. Launching along with the first Tomb of Annihilation adventures will be a new Divine Favor, Kelemvor's Favor. While you will have to earn a new Divine Favor, you will still retain all your unlocked Champions and gear heading into the Tomb of Annihilation adventures. When starting a new adventure the list of requirements now shows a check or an X next to each requirement to tell you if you meet the requirement or not. Ultimate attacks' cooldown time is now displayed with 2 decimal places (if not a whole number). Adventure selection dialog now has two toggleable options to hide completed and/or locked variants from view. Ctrl+tab now has the same behaviour as alt+shift. Added two new damage increase upgrades to Arkhan (level 6 and 15) and moved his other upgrades around slightly ("First in Line" now unlocks at level 3 instead of 4, "Loyalty" at level 9 instead of 8, Arkhan's specialization at 18 instead of 16, and his damage increases at levels 20 and 24 moved to 21 and 25 respectively). Added a new damage increase upgrade to Jamilah at level 25. Updated the ability scores for Jamilah and Arkhan to match the Force Grey character sheets. Earth Mephits have been renamed to Mud Mephits.